Des Moines police have not yet released a condition report on the officer who was run down by a suspect’s pickup truck on Sunday afternoon. Several people in a Des Moines apartment complex called 9-1-1 to report a man was beating two women. Officer Nick Lloyd was among the first on the scene and used his squad car to block the suspect in a pickup from leaving the parking lot. Police say the truck rammed the squad car, twice. Officer Lloyd got out and fell to the ground. The pickup backed up a third time, accelerated, ran over the officer, then crashed into a tree. 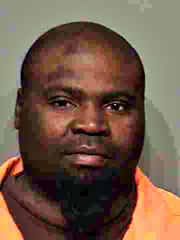 Thirty-seven-year-old Elvin Redmond was pepper-sprayed and taken into custody on at least eight charges, including assault on a police officer, burglary, domestic assault and drunk driving. Officer Lloyd was airlifted to an Omaha hospital for surgery. His injuries include a broken pelvis and two broken teeth. Remond is now also charged with attempted murder.